Beautiful color of golden amber brown that turns to a bright golden yellow if you hold it up to a bright white light. This is topped off with a slightly off-white head that’s about a half-inch thick and built of tiny little bubbles. As the head slips down the glass it leaves a nice lacing in it’s wake. Bountiful hop aroma greets your nose as soon as you empty the bottle. The hops display grapefruit and citrus sensations with some spicy action. That is all backed by a solid sweet malt background, definitely there but not hugely noticeable. The hops dominate the tongue as well bringing in lots of bitterness that hid from my nose. The hop flavor matches the aroma but packs a bit more citrus and spice. The hops really slam you around and one or two of these beers would wreck your palate, so be careful lining this up in a tasting. Deep in the bottom and almost in the after taste is the toasted and honey malt flavors. Medium body with a mouth feel that is initially smooth but then gets very carbonated. This is a fantastic beer and is on the really high end of common IPAs. The after taste is a bit much and lingers for too long. I think this is a great gateway or entry IPA that should slide between and 60 and 90 minute IPAs before introducing someone to hop slam or west coast IPAs. It’s got a great amount of alcohol at 6.7% none of which is really in your face in the taste. Single best thing about this beer? It is available almost everywhere in the area. We are seriously thick with the stuff. Any half-decent better beer seller and most krogers will have multiple 6-packs of this in stock. 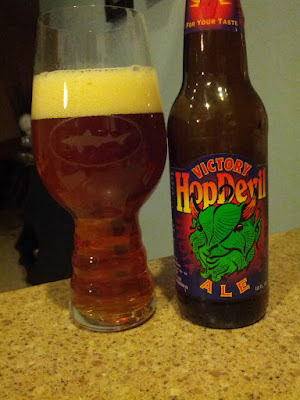 HopDevil is another home run from Victory standing beside my love of their Golden Monkey. Since you mentioned Golden Monkey in this post, have you seen White Monkey yet? I just picked up a bottle today from Hyde Park Wine & Spirits. I’m passing on that because I have yet to like wine and am afraid the wine taste will be too overpowering. But let me know what you thing, I may end up having to try and find some. For the fact it can be pretty easy finding Victory brews, I feel like they don’t get enough love. Agree that HopDevil is a solid brew and Golden Monkey – while getting much love – isn’t talked about as much as it should be. Or maybe I’m just hanging out with the wrong people. I completely agree with you. Many craft beer lovers I talk to have been sucked into the vortex of “rare” “occasional” releases of things like HopSlam. Don’t get me wrong HopSlam is fantastically amazing, but we seem to get over focused on that and forget about things like HopDevil or even 90 minute IPA.